You may have heard someone at GoDaddy Email Marketing describe our Verification step, or you may be just about ready to send your very first email. We have a super quick verification process in place, just so we can be absolutely sure that you'll see smooth sailing, and safe sending! This just means that your account is in pre-verification status. The folks on support need to take a quick look over your campaign, before we can send it out. So, no -- your email has not been sent, yet. But don't worry! Your verification process is started, and you're on your way. Why do you have a Verification Process, anyway?! There are a few reasons that it's important for us to give your mailing a quick once-over, before you send for the first time. And all of them are for your benefit! 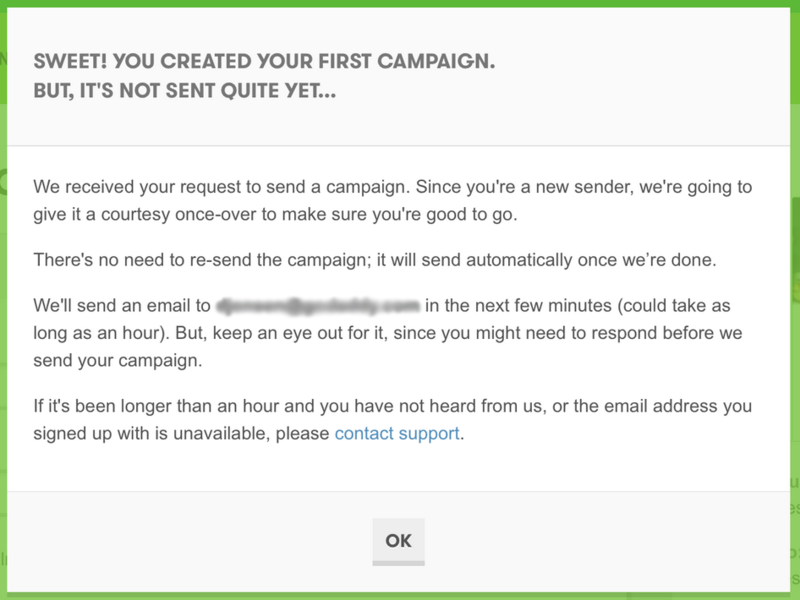 Because GoDaddy Email Marketing is a permission-based sender, we do need to make sure that all your subscribers have opted-in to receive your emails. We also need to be sure that your list is current, so you can avoid damaging bounces and potential spam traps! Additionally, we want to make sure that you haven't inadvertently included anything in your mailing that might get it blocked or sent to junk by inbox spam filters. These are things like link shorteners, or URL link displays, or anything else that might be labeled as 'potentially malicious' by inbox filters. And finally, we're checking to make sure everything looks good! We know you want to make a great impression on your subscribers, and we want to help you do that! We'll check to see if your links are actually clickable, and if you've included a banner image. We'll check that all your images look crisp, too. And if anything seems out of sorts, we'll let you know -- before the email goes! We want to make sure you see all the success you deserve from your epic emailing effort! What do I need to do when I see the Verification Notification? Now, you may have sent your email using a different from address, and that's okay! But all account communications, including this Verification email, are sent to your account email address, always. In a short time you should see an email from one of our lovely support folks. This email will ask you for some details about how you collected your subscribers. We need to understand your process, in order to make sure we're doing absolutely everything possible to get you sending safely and smoothly. We'll also take a look at your links, your images, your layout, your subject line, etc. -- to make sure that it all looks ready to go! We're making sure that you don't have anything that could cause your email to get trapped in a spam filter, or blocked from even delivering. We might mention any of these things, if we see them in your campaign. Then just reply to us! We need to hear back from you with those details, or answers to any other questions we've asked, so we can be sure to get you sending absolutely as quickly and successfully, as possible. What if I sent my email more than once during the Verification Process? While you're in the Verification Process, your emails won't send out. As soon as we verify your account, the latest mailing you've hit Send on will go out automatically (or at the time it's scheduled to go out). If you've hit Send on the same mailing a couple times, don't worry -- only one mailing will be sent. Our best advice is just to hold up a tick, once you see that Verification Notification. If you've sent a couple different mailings, then only the last one will go out automatically, when you're verified. You'd end up having to hit Send on those other ones again, anyway. So just wait a few moments until you hear from us, and then we'll let you know when you have the all clear to send, as you wish! What if I scheduled my email to send out later? Will it go as soon as I'm verified? The short answer here is that scheduled mailings will send when they are scheduled. But because nothing will send while you're still in the verification process, that makes scheduled mailings sort of a special case. It's important to recognize that if the scheduled time for the mailing passes, and your account has not been verified, then the email won't send. Even when your account is then later verified. Because the scheduled time has already passed, that mailing won't be sent. However, as long as the scheduled time for the mailing is still in the future when your account is verified, your email will send, as scheduled. If you have any questions about your particular status, just ask! If you've scheduled your mailing, and you've gone through the Verification Process, but are still unsure what's going to happen, just let us know. We're happy to take a look and help make sure that your emails go out exactly when you need them to. What if I don't see any Verification email within an hour? Let us know, right away! It could be anything from our email not getting into your inbox, to heavy support traffic. But let us know immediately, so we can get you sending. We never want you to be waiting any undue time to get those campaigns to work! Please call our award-winning support team 24/7 at (480) 463-8836. And of course, as always, reach out to us at any time, with any questions or concerns you might have. We're here for you, and want to see you get the most out of your email marketing.